For a printable, 3MB, pdf version of the newsletter, click here. View Past Issues of the Tusculum Newsletter here. This year marks the one hundredth anniversary of World War One, also known as "The Great War" and "The War to End all Wars," 1914-1918. So when more than 50 teachers and museum educators gathered at Sweet Briar on June 14 for an annual themed workshop, Teaching with Historic Places, it was to learn more about the experiences of Virginia soldiers during that war. Because of the anniversary, it's likely many student history projects will feature WWI over the next four years, so teachers were keen to discover local resources. The day began with a keynote speech by noted author, Edward Lengel (professor history at University of Virginia). He talked about the everyday life of American "doughboys" in the trenches. The American President of the war era, President Woodrow Wilson (a.k.a. Judd Bankert), then stepped up to the podium. He reminded us that June 14 was Flag Day, his own creation. We were regaled with Wilson speeches along with an informed assessment of their impact. The workshop also highlighted memorials to the sacrifice of World War One soldiers back here in the Old Dominion. Heather Sutton of Staunton’s Woodrow Wilson Museum and Amanda Williams of the MacArthur Foundation outlined the educational resources of their institutions. Sutton told teachers about a WWI teaching aid, the "Great War Teaching Trunk" available for borrowing, and Williams unveiled the first in a series of YouTube videos about the war that’s geared towards K-12 teachers. In the afternoon, Chris Garcia of the Virginia War Museum, went above and beyond the call of duty. 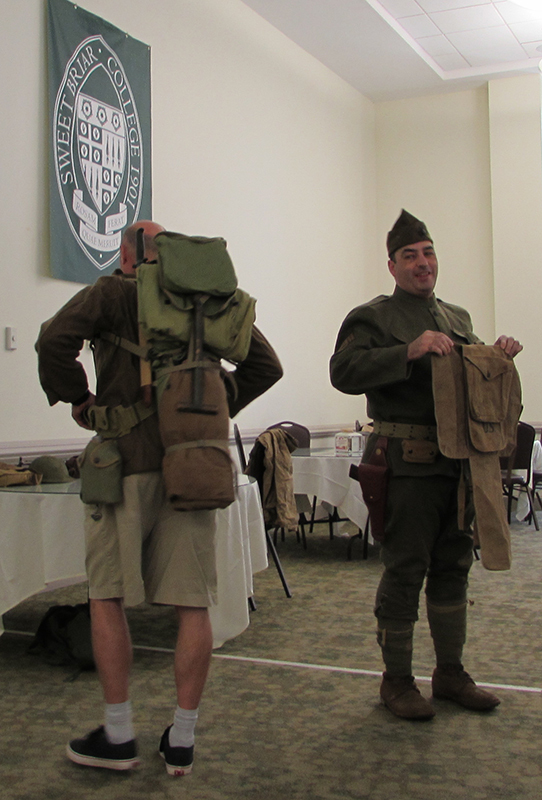 Dressed as a doughboy, authentic to the last detail, he presented a “show and tell” about the dozens of pounds of equipment soldiers carried (Left: participant Tom Allen models a pack). Rounding off the day, Lynn Rainville described some local monuments to WWI (such as the doughboy at the base of Monument Terrace in Lynchburg) and discussed their symbolism. This annual workshop, Teaching with Historic Places, is held in June and co-sponsored by the Department of Historic Resources. Save the date: June 13, 2015 (we will announce next year's topic in March). For photos from the annual "Teaching with Historic Places": Conference Click here. Chris Garcia helps TWHP participant and teacher, Tom Allen, gear-up as a c. 1917 American "doughboy." Eight years ago its future was uncertain, but now an exciting future lies ahead for the 260-year-old historic house that lends its name to the Tusculum Institute. Purchased by Sweet Briar College in 2006, ‘Tusculum’ was the childhood home of Sweet Briar founder Indiana Fletcher Williams. 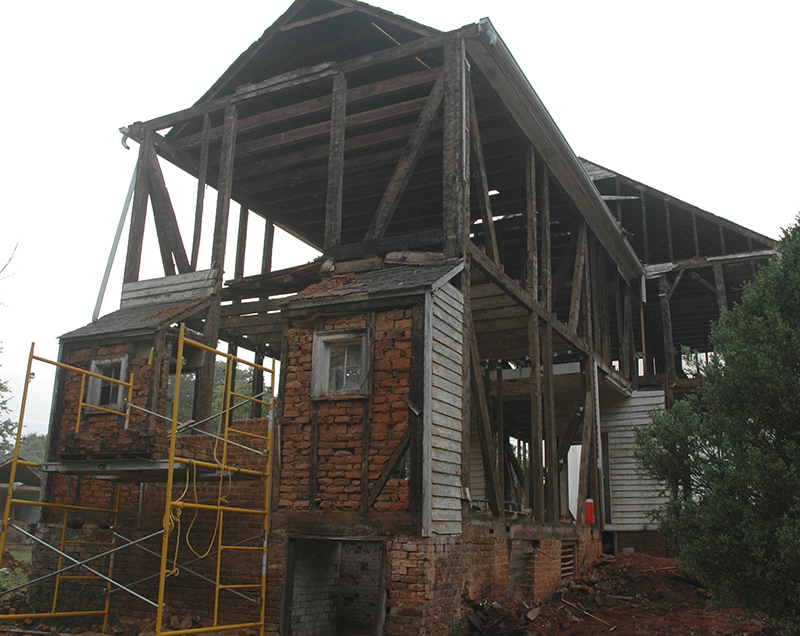 Currently dismantled and stored in a campus barn, the house will be rebuilt and restored to its former glory on an Amherst County property only eight miles from its original site. The new owners, Sweet Briar alumnus Janis Roskelley and her husband Sam, a structural engineer, have extensive experience in restoring historic structures. Their successful proposal rebuilds the 1750s portion of the home, restoring the original entrance and rooms. A modern addition on one side will provide a kitchen, baths, closets and laundry. Materials from an early 19th-century addition will be preserved for future add-ons on the other side. Tusculum Institute director Lynn Rainville says the plan shows an authentic reconstruction of the eighteenth-century house, with conservation of the nineteenth-century fabric. “The contemporary addition brings in modern conveniences without compromising the original structure,” she says. Sweet Briar purchased Tusculum for $12,500 in 2006 and a partnership between Sweet Briar, the Virginia Department of Historic Resources, and Preservation Virginia paid $100,000 for disassembly, cataloging, transport, storage, and preservation. Originally, Sweet Briar hoped to raise funds to rebuild the historic home on campus, but the projected costs rose from the early estimate of $500,000 to more than $2 million. With neither the college nor Preservation Virginia able to fund reconstruction, Tusculum was put on the market in 2013 for $11,500. For SBC news coverage of the sale, click here. And for the News and Advance story, click here. 2006 view: the c. 1805 addition during Tusculum's de-construction. As a first stage, the Roskelleys will rebuild the c. 1750s section. A similar view of the addition a hundred years after its construction. Note the boys sitting on the fence posts. 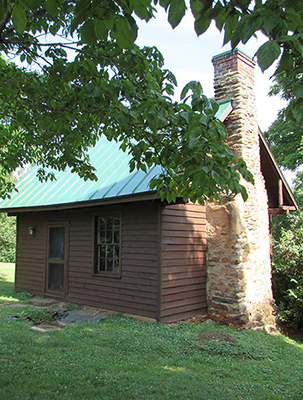 In early 2014, a generous contribution from the Sweet Briar President's Office enabled the Tusculum Institute to oversee the first stage of renovations on the antebellum cabin located behind the President's House (formerly the residence of Elijah Fletcher and, later, his daughter Indiana). This spring the Class of 1976 spearheaded the collection of donations for the second critical stage of renovations. Both restoration phases were conducted by Luke Ramsey and his locally-based company, Ramsey Restoration. The latest work included painting the rusted metal roof and reglazing the 19th-century window panes along with their wooden muntins (pieces of wood that hold the individual pieces of glass in place). 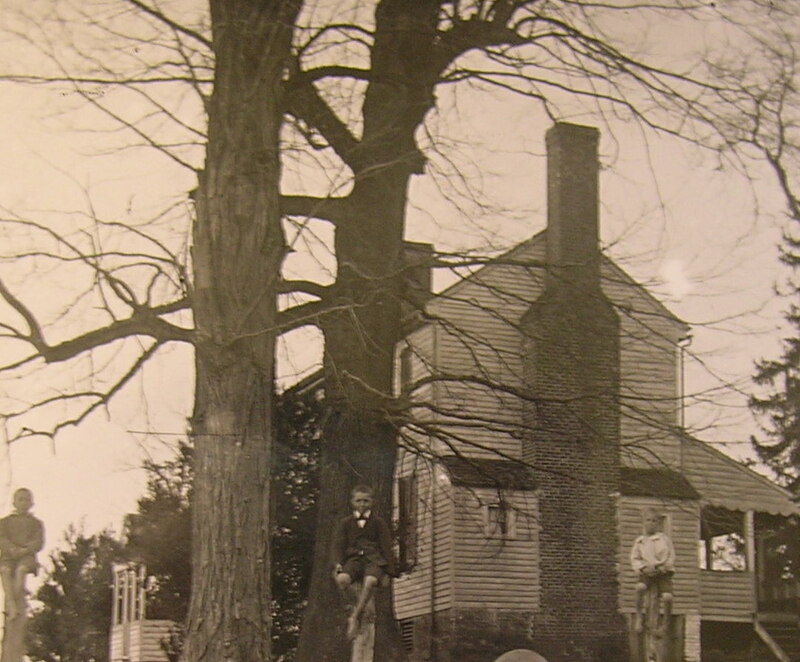 In August, the Tusculum Institute will unveil a new exhibit to be shown in the cabin. Please visit the website for the Fall schedule. The Sweet Briar Slave Cabin after two rounds of restoration on the roof, siding, windows, and foundation. In honor of the centennial of World War I (1914-1918), Rainville has begun a project to locate and photograph all WWI veteran memorials (including church windows, plaques, and statues) and gravestones in Virginia. In August, the Tusculum Institute will unveil the project's website. 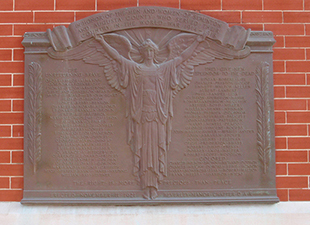 In addition to memorials, this site will contain links to historical society and museum exhibits about WWI in Virginia. If you know of any memorials or monuments to The Great War in your community or local exhibits, please contact us with their location. The Tusculum Institute will announce the new "WWI Memorials in Virginia" website in August, 2014. A memorial to the men who lost their lives from Augusta County (Courtesy of Nancy Sorrells). Please note, we did not publish a newsletter in the spring (Vol. 5, Issue 2) because we were focused on the sale proceedings. For back issues of our quarterly newsletter, please visit our Newsletter Archives. Tusculum Institute is a local history resource center located on the campus of Sweet Briar College providing education and outreach to students, faculty and the wider community and region. Using the rich historic and intellectual resources of the College and working in partnership with the Department of Historic Resources, the Institute supports the preservation of the region’s historic assets and promotes the use of Virginia’s historic legacy as a learning resource. If you wish to support us or have questions, please contact Dr. Lynn Rainville. Let us know if you have friends or colleagues who might enjoy this newsletter. To read more about the Tusculum Institute please browse the menus at the top of the page to explore our website. If you want a printable pdf of the newsletter (formatted to print on 3 pages), please click here.